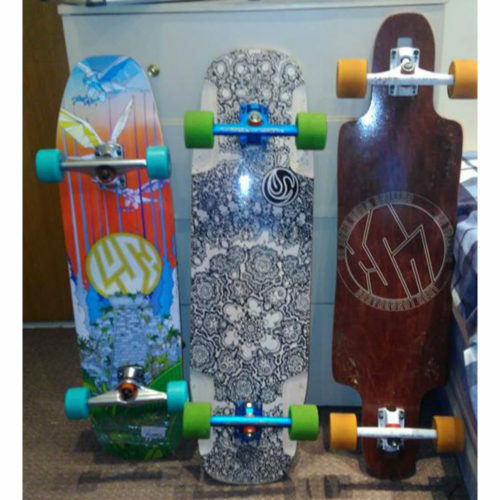 Lush longboards Grifter, CaliberV2 44's,Cult Cerebrum. Lush Longboards Spacbyrd Day, Sabre TKP 170mm, Cult Ism. Lush Freebyrd,Sabre 180mm Hollowlites, Cult Centrifuge. Bought a Lush Grifter and Spacebyrd, someone stop me I’m spending too much money!! The Grifter is a great board for downhill, loads of wheelbase options so you can switch between Freeriding and DH. I like the Spacebyrd cause its small and nimble, the shovel nose isn’t to my liking but whatevs, its a great deck!